We offer a contract wood chipping service to turn low grade wood into a quality wood chip fuel for biomass boilers. Our mobile chipping service is primarily aimed at providing a cost effective solution for customers with their own wood resources. Our chipper is high powered and high producing – an impressive piece of kit! We’re frequently asked about production capacity. Manufacturer’s guidance gives 130m³ per hour, but in practice volume is highly dependent on a variety of factors, such as timber species, moisture content and presentation of the timber and of course the horse power of the tractor. Please contact us to discuss possible volumes and we will try to give you our best guess. Powered by a 300hp tractor, our machinery is easily manoeuvred around sites and operates where larger lorry mounted chippers may not. 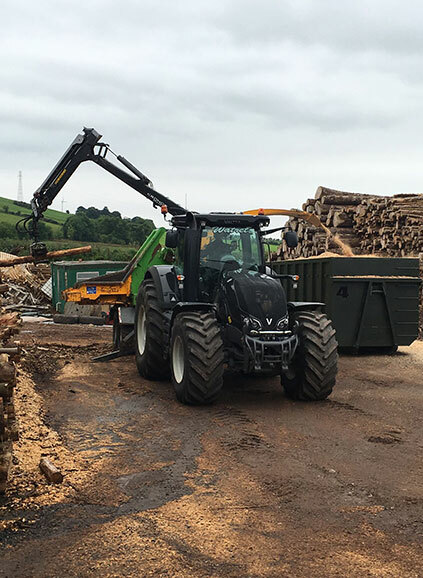 For those sites with logistical problems at the processing stage, we may also be able to provide machinery and equipment such as timber forwarders, tractors and trailers for moving and handling of your timber and wood chip. Please note, we only process virgin timber. Waste or recycled wood is inherent with a high risk of damage to our machinery, just as it is to your boiler and equipment. Chip quality is of paramount importance to us and we will work with customers to make sure that the product we are producing is the one you want. The chipper is fitted with a spout which enables us to blow chip into most locations or containers whether this be directly into the roof hatch of a chip bin, an open fronted shed or a silage trailer to name a few of the common systems we have worked with. For any more information about the chipping service or for quotes please don’t hesitate to contact us.